The University of Texas, Austin has chosen the president of the prestigious Ford Foundation to speak at its commencement this year, but it will be hard for him to outshine last year’s graduation speaker. 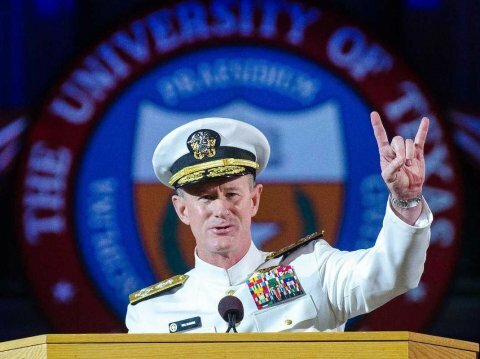 US Navy admiral and UT, Austin, alumnus William H. McRaven returned to his alma mater to give seniors 10 lessons from basic SEAL training when he spoke at the school’s 2014 commencement. It was widely considered to be the best graduation speech of the year. As McRaven describes in his speech, a “sugar cookie” was a someone who failed uniform inspection during SEAL training, and was ordered to run fully clothed into the ocean and then roll around on the beach until every part of their body was covered with sand. In another lesson from his speech, McRaven stressed how everyone will likely fail at some point, and how to learn from those failures. McRaven’s personal stories from his many years as a Navy SEAL supported all of these lessons. In January, McRaven took over as chancellor of the University of Texas System.